A few months ago I commented that every ultra provides an opportunity for learning. Last weekend I learned a lesson I already knew. I suppose I needed reminding. Before I get there, though, I should set the stage. 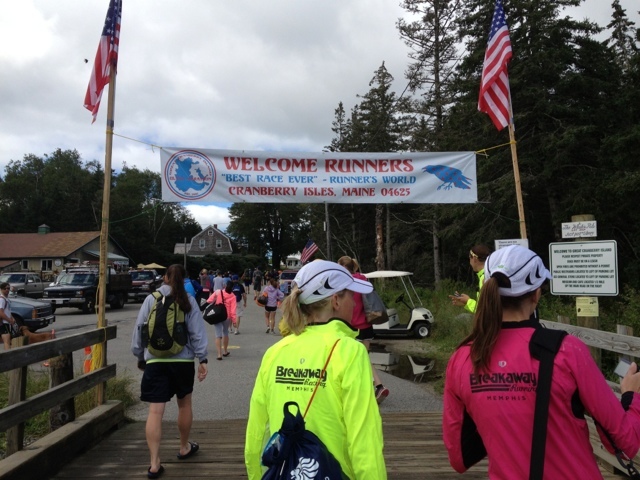 The Great Cranberry Island 50K in Maine has been named the "Best Race Ever" by Runners' World, for whatever that's worth. The race earns this lofty status not from the course, or anything terribly special about the actual race itself, but from the festival, party-like atmosphere that surrounds the entire race weekend. The 50K is run on the only paved road on GCI, a rolling two-mile stretch of asphalt that bisects this remote outpost, reachable by a 25-minute boat shuttle from Mount Desert Island and Acadia National Park. The race is the island's biggest event of the year, and the small but supportive community of island-dwellers turns out in full force to support the runners. 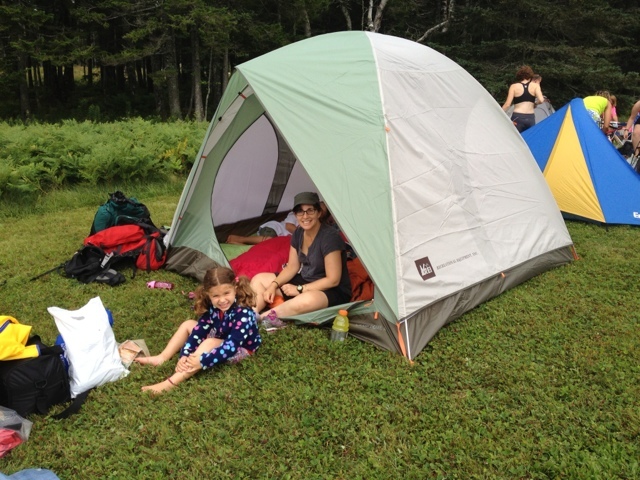 The action really starts when the race finishes, however, as runners, families, and volunteers pitch tents just a few yards from the finish line to enjoy a bonfire, lobster dinner, and outdoor dance party. A bunch of friends from the Albany Running Exchange have been spreading the word about this one for the past couple of years and I was excited this year to fit it into the schedule. I've been trying to build my race schedule this year around trips the whole family could enjoy, and this certainly seemed to fit the bill. Jodi, the kids, and I made the eight-hour drive to Bar Harbor on Thursday, spent a very rainy Friday at our hotel's indoor pool, and made a 9:15 ferry out to GCI on Saturday morning. Local residents with their pickup trucks and golf carts met us at the dock to transport our bags to the camping field, about a half-mile walk away, and pretty soon we had pitched our tent on the edge of a small tent city. I checked in for the race and caught up with a few ARE folks before getting set for the 11:30 am start. The weather was very promising: upper 60's and overcast, it felt like a great day to run. Now, about that lesson. It's so basic I'd call it a rookie mistake, though no ultra rookie would ever be so cavalier as to make it: RESPECT THE DISTANCE. After two pretty-good 50 milers in the past eight weeks, it was all to easy to approach this 50K with the attitude of, "Been there, done that." As race day drew closer, I found most of my energies were absorbed in nuts and bolts of the trip itself--parking, getting to the island, setting up camp, making sure the logistics of having the kids there went smoothly--and I neglected preparing for the little details of the race itself. And the worst of it was, I recognized that this was happening, yet chose to ignore the problem! I spent all of thirty seconds reviewing my nutrition plan, which was basically non-existent. Knowing that I'm particularly susceptible to salt losses and cramping, especially in hot weather, I didn't even pack my bottle of S! caps for the trip to Maine. Why? Well, it's only 50K, and I don't usually need too much salt in a 50K. That was my actual reasoning! I fortified this belief with my experience at RFTH earlier this year, when I ran a 3:32 50K without any salt on only a couple of GUs. Sure, that makes sense, it was 40 degrees that day! I'm sure running with the exact same strategy when it's 80 degrees will work out perfectly! After all, it's ONLY 50K! Not like we're going 50 miles or anything! Getting some water from the girls. Well, you can pretty much guess how the whole thing turned out. After our anniversary trip to Spain (it was awesome, thanks for asking), my training hasn't been quite up to speed over the past month, so I knew going in I wasn't in peak condition, but I was quite sure that I could run in the 3:40-3:45 range on a paved course without too much climbing. Judging from previous years' results, that would be enough to put me in the top three to five, possibly competing for the win. I set out with a goal of running 7:00 pace for as long as possible and seeing where that got me. The weather held for the first twenty minutes or so, and I got out significantly faster than I wanted, running 6:22 for the opening mile before backing off and letting Leigh Schmitt of the North Face open up a sizable lead through the first 5K; I split the 5K in 20:30, much faster than my goal of 22:00, and was already back in fifth place. After that I quickly settled in to 7:00 pace, just as the sun came out and the afternoon heat started kicking in. By the end of the first hour the temps had already climbed into the mid-80s and I was none too pleased. My steady 7:00 pace became a bit of a struggle, but I backed off to 7:10-7:15s and was able to hold that pretty well, coming through 16 miles in 1:55, right on 3:42 pace. Given my (lack of) nutrition plan, though, it was unsustainable. By this time I was back in about tenth place, and it's a testament to how difficult the day was that I ran the second half of the race 20 minutes slower and yet moved up one spot in the standings. Going back and forth on a two-mile stretch of road allows you to see your competition over and over again, and everyone else looked about as bad as I felt, with the exception of just a few folks. Leigh was struggling visibly from about 10 miles onward, and several of the early leaders were later reduced to walking, or DNF'd altogether. By 23 miles I was cramping so badly in my hamstrings and calves that I couldn't extend my stride past more than a shuffle, and I struggled to run 9:00 pace over the final four miles. And all because I had no salt on me and hadn't even paid enough attention to the aid station setups to know where to find any. (In my defense, there wasn't much more than the water, Gatorade, and GU that I was already using, but that's kind of beside the point.) I finished ninth in 4:01:18, about two minutes in front of Leigh, who I passed just before the start of the final 4-mile circuit. Not much more to say about the race itself. I had a terrible race plan, I didn't commit mentally to preparing for it fully, I was more focused on everything else that was going on that weekend--and I paid the price. A race where I could have run very well, been up in the top three on a course that suited me, turned into a lost opportunity because I didn't respect the fact that, even after running a couple of 50-milers, 50 kilometers is still a pretty long way to run. A 20-minute positive split isn't the worst blowup I've ever had, which is probably the worst silver lining in the history of distance running, and feels pretty ridiculous to actually type like it's a good thing. The fact that I still ran 4:01 shows that my fitness level is not terrible, I suppose, but this was a year where I planned to take a big step forward, and at this point trying to draw a bunch of positives out of a 4-hour 50K is pretty weak tea. The rest of the weekend day was great, which I suppose was kind of the point. We ate ice cream, and went swimming off the dock in the ocean, which was insanely cold; we drank lots of good beer and ate a whole bunch of lobster and the girls had fun staying up until almost 11pm and camping out in the tent. Overall it was a great experience. The girls got to see alot of the race and had a blast handing out cups of Gatorade and GUs to the runners, and it was certainly great to have them there to cushion the blow of a disappointing day. But, racing with the family around does present its own set of challenges, particularly in the ability to compartmentalize things from a mental standpoint, and I failed that test miserably this time around.